A bill to force a public vote on Governor Jerry Brown’s controversial plan to divert water from the Sacramento-San Joaquin River Delta through two massive underground tunnels stalled in committee on Friday, May 27. AB 1713, sponsored by Assemblymember Susan Talamantes Eggman, D-Stockton, made it all of the way to the Appropriations Committee, just one step from a vote on the Assembly floor. A statement from Eggman’s office said the progress the bill made “was unprecedented.” Similar bills introduced in the past have failed to advance from even a single committee. Eggman’s bill required approval via ballot initiative for "any infrastructure project that conveys water directly from a diversion point in the Sacramento River to pumping facilities of the State Water Project or the federal Central Valley Project south of the Delta." Eggman said her fight against the Twin Tunnels, proposed under the California Water Fix, continues on “another front.” She and State Senator Lois Wolk recently announced their intention to request an audit of the project by the California State Auditor, following the revelation that the Inspector General of the U.S. Dept. 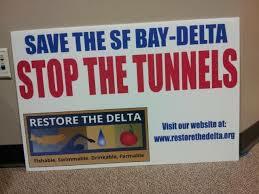 of the Interior had opened an investigation into aspects of the funding of the Twin Tunnels. California voters overwhelmingly defeated a measure to build the earlier version of the project, the Peripheral Canal, in November 1982. Jerry Brown opposes a public vote on the tunnels, as Governor Arnold Schwarzenegger did before him, because they fear the public will vote down the massive public works project. The Delta Tunnels plan is widely opposed by a coalition of family farmers, recreational and commercial fishing groups, conservation organizations, environmental justice groups and Indian Tribes. There is not one Tribe, fishing group or environmental organization, with the exception of the Natural Heritage Institute, that now supports the Delta Tunnels. The tunnels would hasten the extinction of Central Valley steelhead, Sacramento River winter-run Chinook salmon, Delta and longfin smelt, green sturgeon and other fish species, along with imperiling the salmon and steelhead populations on the Trinity and Klamath rivers.